Clackamas County TSP — Virtual Workshop #2 | Kittelson & Associates, Inc. Thank you for taking the time to comment on the projects under consideration for inclusion in the Clackamas County Transportation System Plan Update. At the right, you'll notice a list of layers in a green box. Each of these layers displays a different category of transportation projects being considered for inclusion in the Transportation System Plan. A legend is provided in the bottom left of this page. 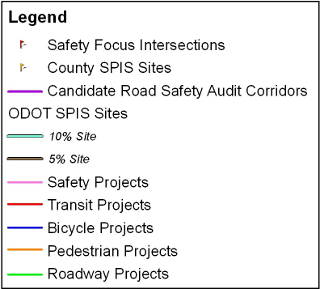 There are also layers showing the Candidate Road Safety Audit Corridors, Safety Focus Intersections, ODOT Statewide Priority Index System (SPIS) Sites, and County SPIS Sites. These locations are discussed in the Existing and Future Conditions Report. The layers can be turned on and off as you explore the map showing different layers of information. Click on a layer in the green box to turn it on or off. It can be useful to turn off all the layers except one at a time to focus on that information. You will notice that some projects appear in multiple layers – this means they affect multiple modes. For example, a project to add sidewalks and bike lanes on a roadway would appear on both the “Pedestrian Projects” and “Bike Projects” layers. Also, the layers overlap so viewing one layer at a time will ensure you don't miss any projects.